We are souls having this life on Earth for soul growth and evolution, according to renowned medium and spiritual teacher, Miki Jacobs. How do you connect to your soul, live from your soul’s purpose and achieve its agenda for this life’s incarnation? 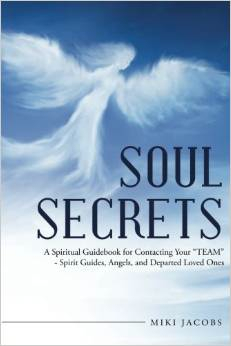 With Soul Secrets, Jacobs provides a complete guidebook to help you find your answers. Miki Jacobs provides both theory – to understand the basic concepts of spirituality and working with your “Team” of Spirit Guides, Angels and Departed Loved Ones – as well as practical advice on how to make contact with your “Team” to assist you in approaching your life with soulful solutions. As Jacobs describes in her introduction, she was not “born” a medium as many others who channel spirit, but learned to do so later in her life. If you are interested in spirituality, life after death, and learning to communicate with your Team in the spirit world, the path is laid out for you in this book. From learning to meditate and quiet your mind so you can connect to spirit, to reading the signs from your Team, this book will help you align with your soul and your Spirit Guides and Angels to become a more loving, understanding and compassionate person. I learned so much from reading this book and have great excitement as I connect with my own spiritual Team following Jacob’s advice. Becca: What is the main message you would like readers to take away from your book? Miki: There are actually three main messages. First I want people to know that despite the harshness of their lives, and the feeling of loneliness, they are never alone. I want them to know that they are surrounded by a powerful and wise “Team” of spirits who guide, support, and protect them at every moment. Second, in my book I teach that anyone can learn how to communicate with their Team, and with spirit in general, at any point in their lives. And finally, through my book, I am trying to help the readers shift their perspective on their lives to that of their souls and not their mind. A very crucial perspective on our lives on Earth. Becca: How did you learn that we incarnate with a blueprint or soul plan for each specific lifetime? Through your Team or other spiritual teachers? Miki: All the information in my book, including the spiritual concept of the incarnation blue print, is channeled from my Team and from other spirits who came thorough in readings and my daily meditation sessions. Becca: Why are we born with an Ego Entity as part of our blueprint? Miki: Despite the destructive and obnoxious nature of our Ego Entity, it has a major role in our overall growth and progress in each specific incarnation on Earth. This is because the Ego entity is supposed to encourage us toward change and spiritual growth once we recognize the outcome of its negative influence on our lives. The Ego Entity also can be used a “gauge” for evaluating and correcting our spiritual path. I often refer to the Ego Entity as “the opponent”. Becca: You mention that when we allow our Ego to influence us to engage in negative actions, the dense negative energy can block the crown chakra and our connection with our Team. What do you recommend to open the crown chakra? Miki: Discipline the ego and manage the ego. Recognize its influence and do the opposite of what it wants. Count to ten before reacting. Align with the higher self and don’t act on the Ego Entity’s temptation and influence. When you are able to ignore the Ego and act from the perspective of your higher self, you will clear up the negative energy and open up your crown chakra. Becca: Is it possible to become an Ego-less human being? Miki: While on Earth, this is not possible. The ego is a component of who we are when we incarnate as human beings. But it can, and should be controlled and disciplined. It is an integral part of our spiritual journey on Earth. If we were to became ego-less, we would not have any more lessons to learn on this planet. Becca: You offer very helpful tips for meditation. What would you say is the most useful tip to quiet the mind and connect with your Team? Miki: Take the focus off of the conscious mind by using other senses. By listening, feeling the inner body energy field, or by focusing on your breathing to name a few. The mind cannot hold two loci of attention at the same time and will be quieted by selecting the one sense or sensation as the one that you chose to focus on. Becca: What is the major benefit of being able to channel your Team? Miki: You can gain the benefit of their guidance and use it in your life. Our main purpose from being here is to spiritually grow and they are right here, all the time, to help us do so! Becca: If our life’s blueprint is pre-ordained, how do we manifest something we want in life? Miki: Only the major events are preplanned. Like gender, race, country of birth, time in which you are incarnating, significant people, etc. It is a framework for your incarnation but everything in between is available for you to manifest. The pre conditions are just that and are created by your higher self, your soul, to set up the circumstances for your greatest growth. Becca: Can you explain how you send remote healing energy to someone/thing in need? Miki: Energy is not bound by time or space and the intention can be sent anywhere at anytime with focus and intention. Becca: How can you tell if the voice in your head telling you “Don’t get on that plane” is intuition from your higher self or Team, or the voice of fear? Miki: The more you practice channeling your Team, aligning with your higher self, and trusting the intuition, you will become more familiar with the way “real messages” sound and feel as opposed to your inner voice. The biggest distinction between the two is that messages from your Team will always be positive and encouraging in nature regardless of the information, while your inner voice will always be accompanied with some negativity like fear. Becca: What recommendations do you have for first-time writers who want to share their knowledge? Miki: Be authentic and true to yourself, your knowledge, and others. Hold the intention of helping others with the knowledge that you have gained through your own experience and the writing will just flow. Also, you must discipline yourself and make your writing a habit. Otherwise you can easily become distracted and never finish your project. For more information, visit www.MikiJacobs.com.